Is some cooler fall weather ever going to arrive in Tampa?! We're averaging in the 90's lately and it's no way to celebrate the official arrival of the autumn season. You're in luck though, 813area has some great ideas to keep cool in Tampa with some indoor fun while we wait for cooler weather! Hit the swankiest mall in town and upgrade your wardrobe. With dozens of high-end stores and restaurants here, you can check out summer sales, grab lunch, check out more sales and then unwind with a drink and dinner at one of the many restaurants that cater to a variety of palettes. This Lutz indoor arena has it all: laser tag, a climbing wall, an arcade, human foosball, and a ninja warrior course. The entertainment center may be air-conditioned, but we can’t guarantee you won’t break a sweat here. Located in Ybor City, GameTime Tampa is fun for all ages. Thanks to a recent $1 million remodel, it’s still the perfect place for all the fun and games you love, but also has a beautiful new restaurant, sports bar, gourmet menu and updated party rooms. With more than 60 TVs to watch sports on and a mega arcade with 120-plus games and simulators, you won’t even notice the sun blazing away outside. When your whole body is screaming for ice cream, treat yourself with a twist on an old favorite. Head over to Snobachi for a something more than your typical soft serve. When you order a SnoRoll, you pick a base — ice cream, frozen yogurt, or almond milk — then choose your toppings and your custom-made SnoRoll will be created right before your eyes on a cold plate. If you have little ones to entertain and they’re getting a little stir crazy staying home, drive downtown to the Glazer Children’s Museum for a day of fun, games, and play-with-purpose. With more than 170 exhibits, they can easily waste away the day here by building forts, making art, playing games, and learning about various careers. Bring swimsuits as well, because the splash pad right outside in Curtis Hixon Park is a fun way to end the day. Where can you go in Florida that requires a sweater? An ice skating rink of course! Head to Florida Hospital Ice to skate or try a class in curling, figure skating or hockey. With four full-sized rinks and one kid-sized rink, there’s plenty of space for everyone. It's a great way to keep cool in Tampa! The world’s first indoor trampoline park and the inventors of “fun fitness,” Sky Zone offers a "fun" workout with its open jump ticket which includes the main court, dodgeball, foam zone, sky ladder, & sky slam. With one of the largest Greek and Roman antiquities collections in the southeastern United States and a dynamic annual schedule of special exhibitions, the Tampa Museum of Art is the perfect antidote to the summer blahs. Wander through the award-winning building and check out the stellar collection of contemporary photography and new media. Grab a bite and a drink at Sono Café downstairs, and watch the boats go by on the Hillsborough River. When you’re lucky enough to live in a city that has its own world-class waterpark, take advantage of that! There are 10 water slides for every level of bravery. With a 17,000-square-foot wave pool to jump around in and a lazy river to float down, you can cool off in no time at all. It may be too hot for the beach, but you can still enjoy being around the denizens of the deep when you spend a day at the Florida Aquarium. Check out the exhibits, play with the stingrays, and when you’re all done - head outside for lunch at Café Ray while you watch your kiddos frolic in the Splash Pad. Here’s a twist on a classic that’s fun and yummy - at Astro Ice Cream, you’ll get your dessert made right in front of you when liquid nitrogen is used to flash freeze the ingredients. The ice cream shop is located at Armature Works, Tampa’s hot, new mixed-use space that draws hundreds to its Heights Public Market. Eat, drink and shop the hot afternoon away in this huge, historic building on the banks of the Hillsborough River. Embark on a cool, mountain adventure without leaving home when you spend a day at Vertical Ventures Tampa. Whether you’re an experienced climber or a newbie, you’ll find safety and adrenaline rushes here with 60-plus bouldering routes, a freestanding boulder, 10 rope stations, and a treadwall. 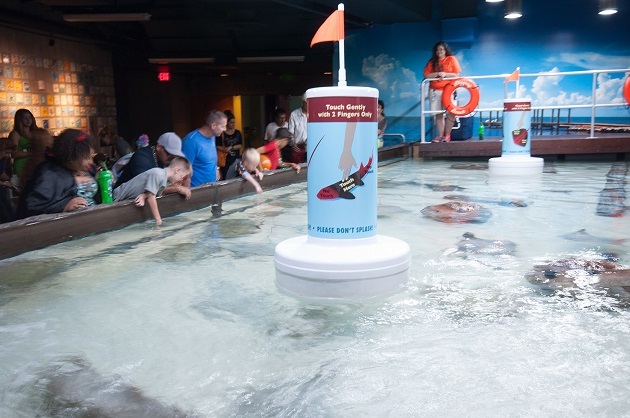 Keep cool in Tampa with some indoor fun! Try something on this list or let us know if you have a favorite that we missed in the comments below. For more ideas for things to do in Tampa, register on 813area, your free guide to everything in Tampa Bay!